Umm…so you guys think I’m pregnant? Is that what I’m getting from all those comments I got after yesterday’s post? I mean, what in the WORLD could possibly have given you that impression???! I just had to have a little fun with it for a minute (because way back when I was pregnant with my first, and I didn’t tell my Spanish students until I was 5 months pregnant, and one high school doofus boy asked me outright if I was, I totally chickened out on what I actually wanted to do—which was fake bursting into tears while wailing, “Are you saying I’m FAT? ?—and I still regret not doing it to this day). Did I have any of you worried? After all, you picked up on all of my (rather obvious) hints so handily (although I did get a couple of hilarious responses from some folks who were a little worried about me at first! : )) that I really can’t have carried on my, “I’m so outraged!” charade for too long. And can I just say THANK YOU that not even one of you asked me if I knew how such things came to be. (I got asked that when I was pregnant with my second, believe it or not; but probably mostly because my first was only 9-months-old). Yes, I know how it comes to be: I’m a baby-making machine, that’s how! But really, your kindness, sincere congratulations, and funny responses pretty much (okay, TOTALLY) made my day. You guys are the absolute best! So, you’re probably all itching for the classic sideways belly shot (because I would be; if you couldn’t care less, free to scroll on), but don’t get too excited because I snapped this one early in the day, and my “pregnant look” is pretty much directly proportionate to how much food is in my tummy these days. (I would also like to point out that I’m not usually a “progress shot” every week kind of girl—and probably still won’t be—but I’m making efforts just for you guys because I like you so much). A lovely, slightly blurry makeupless, glasses-wearing, wet-haired shot for your first real glimpse of Lil’ Bit #4 (who shall henceforth be dubbed “LB4” until we have established gender and decided on a name). And now for the REAL reason many of you are actually here! To see last week’s features and to link up whatever new fabulousness (fabuliciousness? fabulosity???) you’ve whipped up for this week’s party! Here we go with the fabu-flippin’-goodness! So, you guys probably already know that ottoman knock-offs are kind of dear to my heart (if you don’t, take a look at the upper left hand sidebar), and I think this Ballard Design inspired tufted ottoman shared by From Gardners Two Bergers is just killer! By the way, I had never put together, when I stumbled upon this great ottoman, that I already knew its creator and that she read my blog and had a fantastic one of her own, even though I’ve enjoyed reading her comments for quite a while now. If you are a reader with a blog, please let me know so I can stop by, follow along, and put a face with a name. I LOVE that! 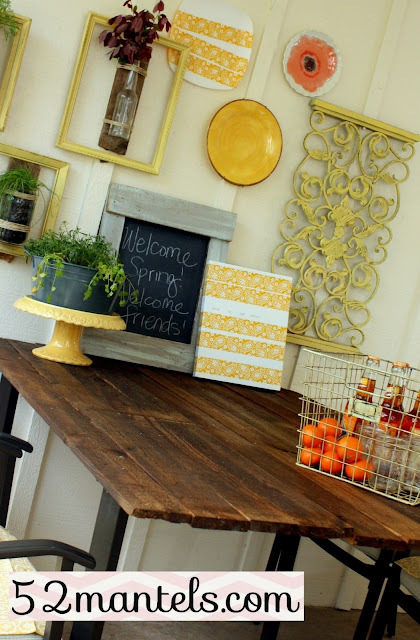 I’m also a little envious of this awesome reclaimed wood tabletop + porch spruce-up from 52 Mantels. I want my back patio to look that cute! (My internal voice of reason just said, “But then you would have to make it look that cute!” and I answered, “Okay, I’m good with how it is then”). And can you imagine how much better your fence would look if you hung a few of these little planter pots like The Life and Times did (well, now you can do more than imagine, right)? 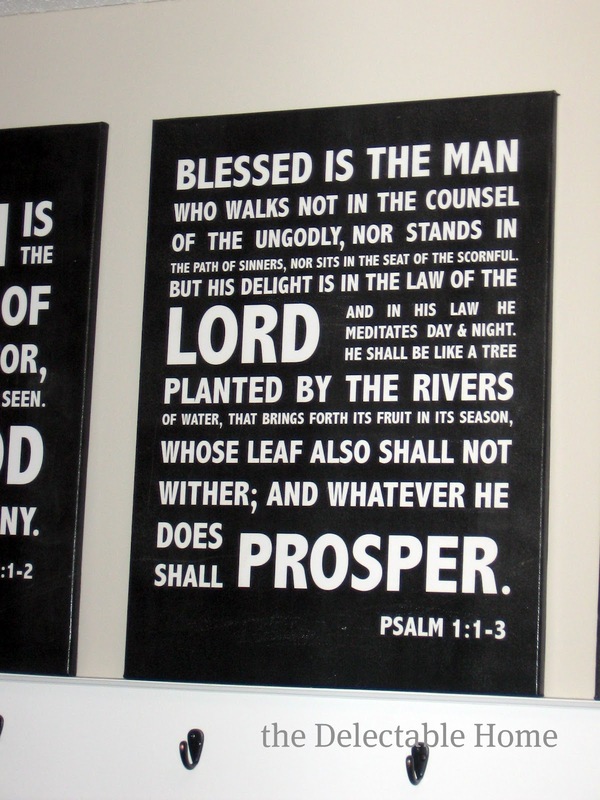 This Psalm 1 subway art from The Delectable Home is so crisp and inviting and such a fantastic reminder! And this simple salad + homemade crescent rolls (she shares her recipe) from It’s Just Laine has my mouth sprinkling leaks (‘scuse me while I get a napkin). Good bread and any kind of salad that involves cranberries, feta, and nuts is pretty much food heaven for me! This chicken wire faux mantel display from Queen of the Creek is such a perfect example of working with what you have to make your home beautiful. LOVE it! And I just can’t get over how consistently brilliant the girls over at My Sister’s Suitcase are. I mean, an old chair converted into the world’s cutest planter? Stop it. Just stop it. Finally, speaking of great ideas for chairs, I really love the simplicity of this stenciled burlap chair redo from Superfluous. (Plus, her curtains are made from the same fabric I’ve already bought to make our bedroom curtains, so I appreciated the visual : )). Thanks for making my job so easy with your awesomeness! Feel free to grab a button from the sidebar if you’ve been featured! And now it’s your turn again! If you’ve blogged about it, I want to see it! 4. PLEASE, no shops or giveaways! and/or join our Facebook page! Nice blog. I have just bookmarked this page so I don’t miss any more of these.I would never have normally come here to read the blogs but I’m really glad I did.I will definitely be coming back. fifteen years ago, we made a list of what we wanted and expected as customers. offered the highest QUALITY products and backed them with excellent warranties. new products to ensure we are providing the highest quality products available. Bill Bischoff, owner, has over 30 years’ experience in the industry. You have made really some good points in this post. I appreciate your writing skills. Oh, you’re so welcome, Emily! You definitely deserve the feature, and you DEFINITELY deserve the break to be with your hubby (you *know* I can relate!). Second, I’m SO sorry I missed your party and your SWEET feature!! My hubby came back into town (boo work travel!) and my thoughts completely left all things blog for 2 blissful days. He’s back on the road (major sad face!) and I’m catching up on all that I’ve missed. But, thank you so much for the feature!! Such on honor to be on your beautiful site! hello. You have a beautiful blog here. I liked it very much.Happy to follow you dear. Do visit my blog in your free time. Thanks for featuring my scripture subway art, Abbie! Once at a party someone said to my husband (in reference to my pregnancy), “Man, you really need to get a hobby!” Charles just smiled and said, “oh, I have one.” I almost spit my drink out on the floor. Hope you’re feeling okay! Also, been following and getting email subscriptions for a while, but never managed to get in on a linky party! 52 Mantels table top and room is excellent’e and Delectable Home makes awesome subway art. So much talent huh? You make babies, that’s an art too. Hi Abbie, this is my first time to join your party. Thanks so much for hosting! Congrats! Congrats Abby! How exciting! I don’t know where I’ve been, but after following your blog for awhile, this is the first link party that I’ve noticed. Oy. I’m glad I finally noticed. Thanks for hosting! Hi Abby – Love the picture you posted – and if it makes you feel better, my daughter has not let me take her picture to post every week either! I love linking up every week, so thanks so much for hosting! (I can’t believe that it has taken me this long to become a follower – but I am now!) Would love for you to come visit me when you get the chance! Thank you for hosting. This is my first time linking up. Congratulations. This is crazy I found you through another link up and I am so excited to find your blog. I am going through master bedroom hack right now. I just wrote my first post about it today on my family blog http://www.kidtogrownup.com and feature a sneak oeak of the second part on my personal blog http://www.bobbobabble.com. Congrats and I can’t wait to read more of your blog. Awww Congratulations on your pregnancy. How exciting. You are too adorable!! Congratulations! And keep up the “everything and the kitchen sink” parties! I love looking at all the creativity, and am excited for all the crafts I will have a chance to link up during my break coming up! Well, congratulations to you! I was pretty sure, considering all the obvious hints! Thanks for hosting — this is my first time to join, so I’m excited! I’m a new follower. Congrats! How exciting!!! Thanks for hosting! Abbie! First, congrats!! Second, thank you so much for the feature. Based on the other features and all of the link ups so far, I am in great company! Thank you for hosting! Thanks for the feature! And congrats on your pregnancy!!! You really do have the BEST readers. I love all the positive comments. I’m expecting #4 and you wouldn’t believe (or maybe you would) the rude comments and questions I’ve gotten. It’s refreshing to read all the excitement! Congratulations and prayers for a healthy pregnancy! You know, you look really adorable in glasses! And with an ever-so-slightly-pregnant belly. I love the ottoman you featured! And the reclaimed wood table! One of these days I’m going to have to take advantage of my brother’s skills as a journeyman welder and make an industrial/reclaimed-looking table like that one. CONGRATS on your pregnancy! So exciting! Thanks for hosting this awesome topic. EEEEEKKK! How exciting! I’m so happy for you. Babies are such a blessing. A million congrats!!! Congrats on baby #3. Thank you for hosting! Congrats on the pregnancy!!! And fun features, I am in love with Emily’s redone patio!! Love the features! Nice picks!! Thanks for the party, have an awesome weekend! Thanks for featuring my burlap chair! I love that we have the same curtains. Thank you for hosting! Congratulations!! What?! You’re pregnant?! ;D Glad the post went over so well and if I haven’t said it already, congrats! 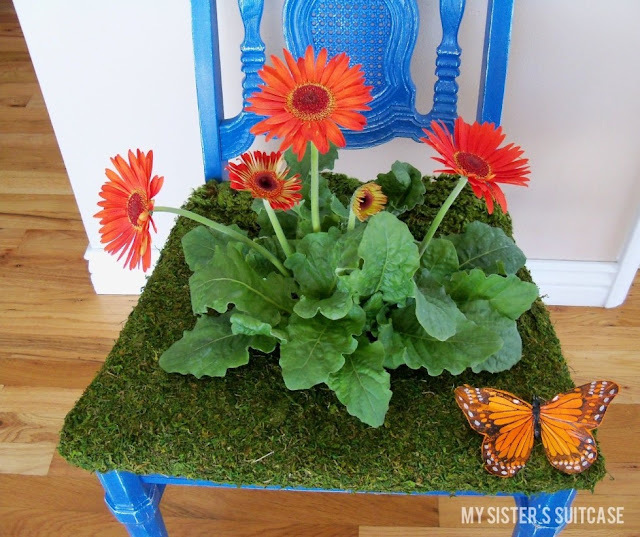 that chair planter is so fun!! Congratulations to you and yours! Thank you for hosting a great party full of fun inspiration! Congratulations!! Thas is so happy and exciting to hear! Thanks for hosting too! Congratulations!! That is such exciting news!! And thanks so much for the feature…I really hope you like the salad. It was one of my very favorite things to eat when I was preggo with my own #4, who’s now 4 months old. Pregnancy is so exciting, looking forward to watching your bump grow! (And you’re so tiny BTW, wow!!) Congrats again!! Congratulations Girl! I’d say you are brave (I’m pregnant with #3 and still wonder at my sanity. LOL) Following your instructions, yes I have a blog. And yes, I read your blog too! Hope you have a marvellous weekend! Thanks for hosting! And congratulations!! !